Prime Minister Benjamin Netanyahu loves to use social media as a tool to settle accounts with those who dare to challenge his policies, often in demagoguery that panders to the online mob both in content and style. 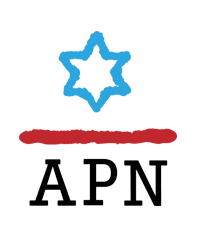 On Sukkot Eve, it was us, Americans for Peace Now, who were the target of Netanyahu’s bluster. Why? Because we dared to highlight his West Bank settlement policy at a special United Nations Security Council session. At the gathering, APN’s Lara Friedman delivered a measured, fact-based analysis of the damage that West Bank settlements inflict on Israel’s national security. We are proud of Lara’s performance at the security Council and gratified to have been given the opportunity to share with the world our deep concerns about the direction in which Netanyahu’s policies are leading our Jewish homeland. Netanyahu, in a misleading Facebook post, falsely accused us of alleging that the settlements are the cause of the Israeli-Palestinian conflict. We never make this argument. Early this week, the Washington Post ran a piece titled, “In the settlement of Kiryat Arba, the demand is to expand.” If you just read the title, you might think it was about the continuing growth of Israel’s settlements. If you only read the first few paragraphs, you might think that it was about the shocking murder of Hallel Ariel and the cynical use of her death to promote settlement growth. Who is helping lead the charge to bring this “outside pressure”? Peace Now. So it is no surprise that in the same article, when the Washington Post wanted to learn the facts about Israeli settlements from an authoritative source, they turned to Peace Now’s Hagit Ofran. Last night, Netanyahu’s right wing government pushed a law through the Knesset to silence dissent. Although it was touted to the public as a matter of transparency, the reality is that this law is aimed at Peace Now and other progressive groups. Never mind that all non-profit organizations receiving funding from foreign governments must already disclose all such funding. Never mind that NGOs on the left, which are already transparent about their donors, are publicly branded, in effect, as agents of foreign governments. Never mind that right-wing groups – whose agendas align comfortably with that of the current Israeli government and who receive millions of dollars in donations from foreign individuals and entities – are able to keep their donors secret. I am proud to introduce Tough Questions, Expert Answers, a new APN publication series which tackles seminal issues pertaining to the conflict. In a world where soundbites dominate, it is critical to take the time to understand the issues that can change the world- for better or for worse. The first edition in the series is a Q&A on the Temple Mount. With tensions growing by the day over the world’s most contested religious site, this timely explainer by Jerusalem expert Danny Seidemann is a must read. As Danny correctly states, "the battle over the Status Quo at the Temple Mount/Haram al Sharif has increasingly become a proxy for the Israeli-Palestinian conflict writ large." On Purim 2016: "Not in every hour does a miracle happen." Purim is upon us. Most Jews who celebrate Purim remember it as the story of the evil Haman who bribed the buffoonish King Ahaseurus to kill all the Jews in the Persian kingdom as a result of his rivalry with the Jewish courtier Mordecai. The Jews managed to depose Haman, and convinced Ahaseurus to let them fight back and slaughter those who would have stood against them. The key to understanding the story is a statement by a fourth century Babylonian rabbi who lived centuries after the story might have happened, in the place that it was supposed to have happened—Persia. That rabbi, Rava, added one observance to those listed in the Esther scroll itself (feasting, exchanging gifts, supporting the poor and reading the story): “A person is obligated to get drunk on Purim until he cannot tell the difference between ‘blessed is Mordecai’ and ‘cursed is Haman’.” This is a very specific obligation. There is a specific goal here. I came from a long line of worriers — we’re Jews after all! My parents worried that I’d never make a living as a songwriter and urged me to become a shoe salesman! I didn’t become a shoe salesman but I remain a worrier. 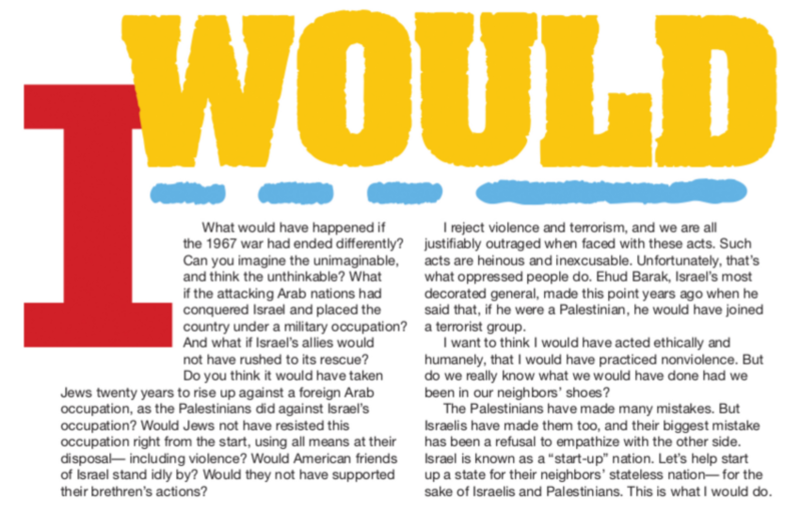 I worry about Israel today, after nearly 50 years as an occupier of another people. The Occupied Territories hardly figure in the public discourse in Israel these days, and yet the occupation won’t go away simply as a result of inattention. The attitude of right-wing extremist supporters of Israel also worries me greatly. When you tell them that constructing peace is a complex undertaking, that it requires both imagination and pragmatism, they’ll dismiss you by dumbing down the Israeli-Palestinian conflict. They say things like, "The Muslims want to destroy Israel" or "The Arabs refuse to recognize Israel as a Jewish state" or "If the Arabs had accepted Israel in 1948, the Palestinians wouldn’t be where they are today." They say things like, "Israel has no partner for peace," ignoring the Palestinian government's renouncement of violence against Israel. They even have problems with the Palestinians using a non-violent diplomatic path towards peace by turning to the international community for support of their national aspirations. Extremists here and in Israel will never find a situation in which Israelis and Palestinians can reach an accord and a Palestinian state can peacefully come into existence. That’s why I’m so worried — and infuriated. New Year for trees, nothing new for Palestinians. On Monday, most Israelis will celebrate Tu Bishvat by cherishing the fruit of the land and planting plant trees. But in the West Bank, extremist settlers routinely destroy trees belonging to Palestinian farmers - not to mention other forms of vandalism and assault. According to the United Nations Office for the Coordination of Humanitarian Affairs, 11,254 trees have been vandalized in the West Bank in 2015, a 20% increase over the previous year. It is bitterly ironic that many of the trees these cowards choose to uproot or vandalize are olive trees - the very symbol of peace. The Israeli government’s gift to Washington this holiday season was the gift of occupation. Literally so. You may have missed the story because of the holiday, but shortly before Christmas, Benjamin Netanyahu’s ambassador to Washington, Ron Dermer, proudly announced that this year, instead of sending products made in Israel to American friends, he is breaking with tradition and sending gift boxes containing products made exclusively in settlements in the occupied territories. Allegedly, this was intended as a message to those who call for punitive economic measures against Israel (ironically, it plays into their hands), but it clearly was aimed at the Obama administration’s rejection of Netanyahu’s settlement policies. Another Netanyahu finger in the eye of an American administration that had the audacity to attempt to broker peace between Israel and the Palestinians.